Imphal, Nov 29 : A bridge on National Highway 37, used by trucks for transporting essential items to Manipur from Assam, has been damaged in an IED explosion in Cachar district of Assam, officials said here today. 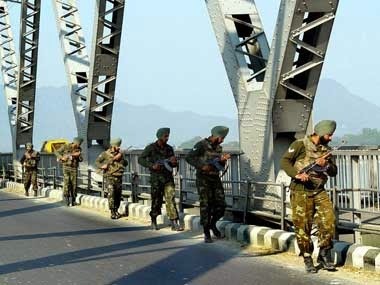 A major portion of Chirpur bridge, built over a river on the Imphal-Jiribam-Silchar highway, was damaged last evening when IED kept along the bridge exploded in Fulartol area in Cachar, the sources said. “It will take about three months to repair the damage, during which no heavy vehicles would be allowed to ply,” Commanding officer of the 765 Border Road Task Force (BRTF) battalion, Col Binoy Bal, whose battalion maintains the bridge, said. Representational image. AFP Representational image. AFP The impact of the blast was so severe that glass windows and doors of nearby houses were damaged, the sources said. The bridge is located 10 km from the Manipur border town of Jiribam and about 222 km from here. Most of the Manipur-bound trucks from Assam, carrying essential items, were using the bridge to reach Imphal since the last few months as the trucks were facing extortion demand from militant outfits on NH 2 (Imphal-Dimapur-Guwahati), the sources said. Manipur is linked with Assam and Nagaland by NH 37 and NH 2. It was being investigated whether the militant outfits, who used to illegally collect ‘tax’ from vehicle owners on NH 2, were responsible for the explosion which would then compel the trucks to use the NH 2, the sources said.